CANADIAN DEFENCE MATTERS: AUTONOMOUS ARMED DRONES, THE FUTURE OF WAR ? AUTONOMOUS ARMED DRONES, THE FUTURE OF WAR ? On 1 November 1911, during the Italo-Turkish War, Giulio Gavotti flew his Etrich Taube monoplane on a bombing raid against Ottoman military positions in Libya. He took four grenades, each of a size of grapefruit and weighing about four pounds, and, while flying at an altitude of 600 feet, dropped three onto the Tagiura oasis outside modern Tripoli, and one more onto a nearby military camp at Ain Zara. Gavotti’s attack injured no one. 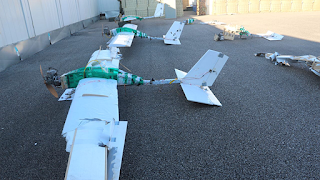 Commenting on the attack Major General Aleksandr Novikov, said that it showed the “emergence of a real threat of the UAV use for terrorist purposes anywhere in the world.” The assessment of the drones also revealed that any jamming countermeasures would be ineffective. “The research showed that the avionics equipment mounted on the drones facilitated their fully automated pre programmed flight and bombing, ruling out any jamming,” Novikov said. War, it has been said, does not change but warfare does. The way in which wars are waged changes constantly under the influences of technology and cultural forces. Colonel (PhD) Gjert Lage Dyndal writing in NATO Review describes autonomous drones as” drones that can act based on their own choice of options” Such drones, he points out are programmed with a large number of alternative responses to the different challenges they may meet in performing their mission. It is reported that the US and Chinese militaries are starting to test swarming drones – distributed collaborative systems made up of many small, cheap, unmanned aircraft. This new subset of independently operating or “autonomous” weapons is giving rise to new strategic, ethical, and legal questions. While it might seem odd to program weapon systems based on the behaviors of insects it is important to remember that the insects that use these swarming strategies most successfully are considered to be, like humans, an extirpator species-meaning they deliberately seek out and destroy rival organisms (including their own species) to maintain absolute control of their territory. Ants that utilize these stratagems are among the most successful organisms on the planet. Some analysts even suggest that such swarming strategies, when used by humans, have historically won sixty-one percent of all battles-and an even greater percentage in urban terrain. Examples would include Grozny, Stalingrad and Mogadishu of ‘Black Hawk Down’ fame. Discussing what they refer to as Pervasive Semi-autonomous Systems in the 2009 publication Projecting power - Canada's Air Force 2035 the RCAF suggested that such “ systems will become increasingly interconnected and multi-tiered.” They also noted that “Semi-autonomy or, in certain cases, complete autonomy will be a feature of all future platforms and systems.” They also believe that “. Since semi-autonomous and autonomous sensors and equipment are at the heart of systems that collect data and assist in its fusion, human agency will continue to be a part of the controlling process of those systems.” It is not clear if they believe that putting the word “will” in italics insures that the future will unfold as they would like it to. Gavotti’s 1910 attack caused little damage but is seen by historians as the first example of what became the strategic bombing campaigns which have characterized warfare since that time. A direct line can be drawn from his raid to the dirigible bombing raids on London during WW1 to the thousand plane raids on Berlin and Dresden of WW2 and on to the pervasive use of airpower in our own century. In the same way the attack by what appear to be armed autonomous drones against Russian positions in Syria, for all their lack of effect, may in the future be seen as the beginnings of a new kind of warfare. As with the dropping of bombs from heavier-then-air aircraft it would appear that the use of autonomous drones is limited not by the technology but rather the political will to develop and use politically sensitive technology. In fact the technology which would allow lethal machines to operate without being under the direct control of humans is widely available. It awaits only its first successful use. After Gavotti’s mission, as well as further Italian bombing raids, the Ottoman Empire issued a protest. The dropping of bombs from balloons had been outlawed by the Hague Convention of 1899, but Italy argued that this ban did not extend to heavier-than-air craft. Needless to say, these protests had no effect.